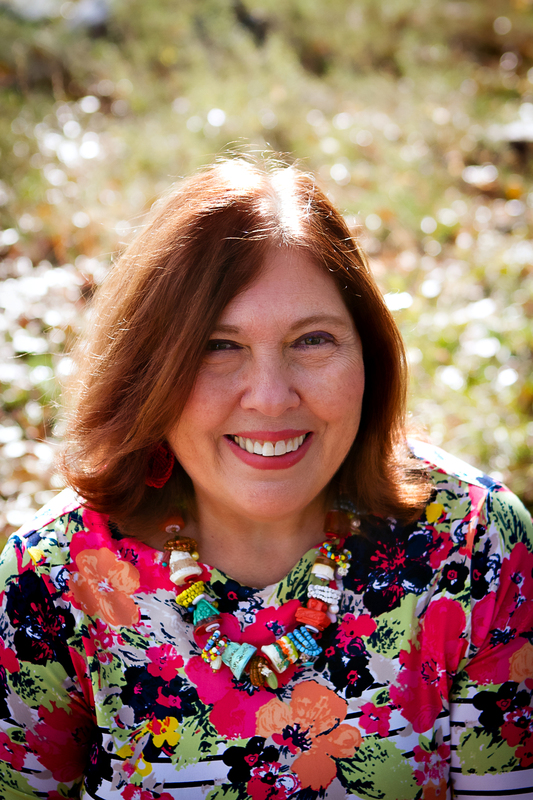 Karen Friedland is a Right-Brain Business Plan® licensed facilitator based in New York. She’s the February guest host of our RBBP Facebook group so make sure to stop by and get some support and encouragement from her. Plus, check out Karen’s free gift 15 Great Apps For Artistic Solopreneurs. What is your business and what makes your business unique? I am a visual artist, principally a painter, a teaching artist and a creative business coach. 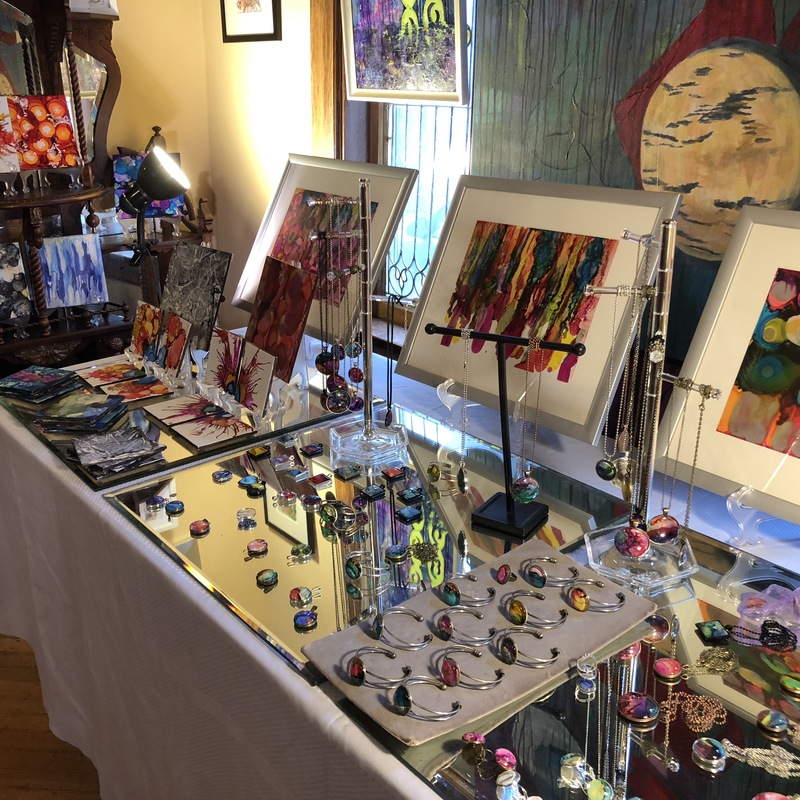 There are two main prongs to my business: sales and marketing of my art and art-related products and my teaching- art and creative expression- and coaching creatives. My vividly hued artwork makes one’s spirit soar. It is a sensory experience that brings happiness through the use of color and satisfaction as one unravels the layers of complexity in the art. 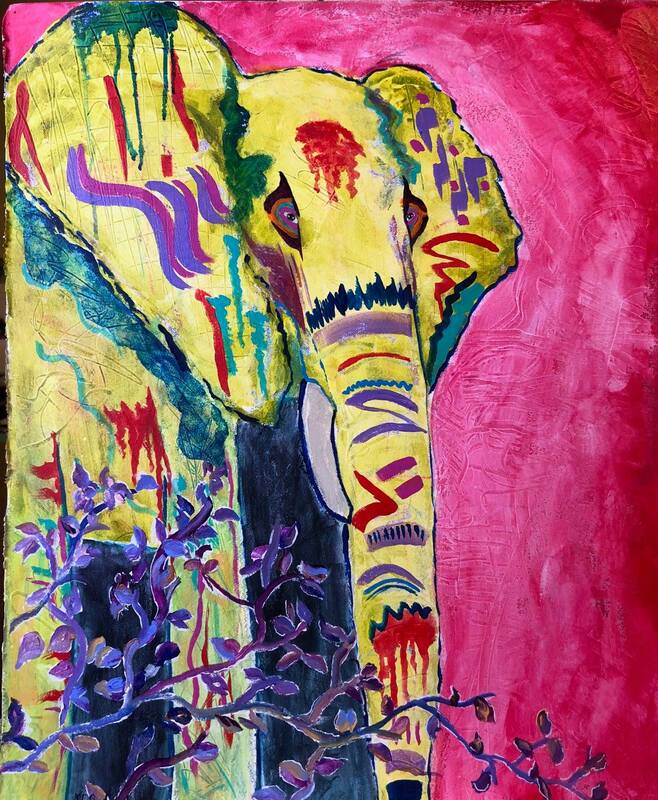 I sell my original artwork and reproductions. In addition, I offer hand-painted ceramic tiles, a line of original hand-painted jewelry and ART SPARKS, a creative project inspiration card deck. 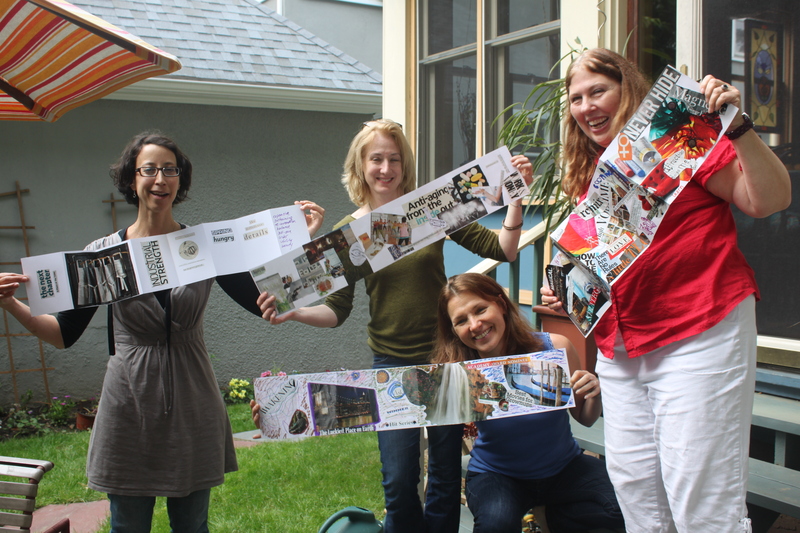 My teaching includes in-person workshops and courses, online courses and artist residencies. I am that rare bird, an artist with a business sensibility, with a career in marketing and received an MBA before becoming an artist. I have been a Creativity Coach for 13 years. How has the Right-Brain Business Plan® helped you? What is different for you and your business after approaching planning in a creative, visual way? When I first heard of Jennifer Lee’s Right Brain Business Plan, I was listening to it on Creative Live while I was on a trip. I walked around with it plugged into my ear because I didn’t want to miss a minute. I knew it was meant for me. I then became part of Jennifer’s mentorship for several years. The first and biggest change, was my perspective. I no longer was just an artist who sold her work, rather a business owner whose business is creating and distributing art and art products. I determined that my mission for my business is to bring artistic expression that is colorful, joyful and freeing. RBBP has helped me identify who my client is so I can reach out directly to them. By understanding the who, what and why of my business, I have been able to move forward in an effective way. What goals (big or small) on your business plan have you already accomplished or have made progress on? Over the years, I have set and reached many goals. I have also set goals that I have not attained. I realized from going after them, that they were not things I really wanted. An equally valuable lesson. I have attained interim financial goals. I have refocused my teaching from children to adult students and developed a following. I have developed new products including a creative project card deck, a jewelry line, a line of miniature paintings and of painted ceramic tiles. I have rebuilt my website, created an Etsy shop, have a regular blog and a significant presence on Instagram. I have created new syllabuses for course offerings and produced several courses online. Why do you love teaching the Right-Brain Business Plan® and using it with your clients? What are some client success stories? I love teaching the Right Brain Business Plan because it takes one’s concept of how they might reach people and gives them a format, a structure upon which to build their business. It brings together the concepts of business with the creativity and entrepreneurship of individuals to let them attain their dreams. I love that the Right Brain Business Plan allows creatively-oriented people the means to understand and apply business principles to their endeavors to help them reach their goals. My clients have taken their business ideas from just a kernel to creating a full blown plan of how to launch and build the business. They have gained an understanding of who they want to reach and how to reach them. And then they created a timeline for implementing their programs. How do you use your creative intuition in your work? My creative intuition is a key part of every aspect of my business. In my art-making and product development, intuition is the determining element that adds originality and that special “extra something” to make the work exceptional. Likewise, as I bring my visibility and authenticity to the forefront, I take an inventive approach to meeting the world and letting them know about my business. I want the world to notice, to see what is uniquely me, so I need to present it in a way that gets me noticed. This too takes innovative thinking. Is there anything you’d like to share about your Right-Brain Business Plan® in terms of what it’s made out of or how you made it? I made early RBBPs in the standard accordion-fold way. 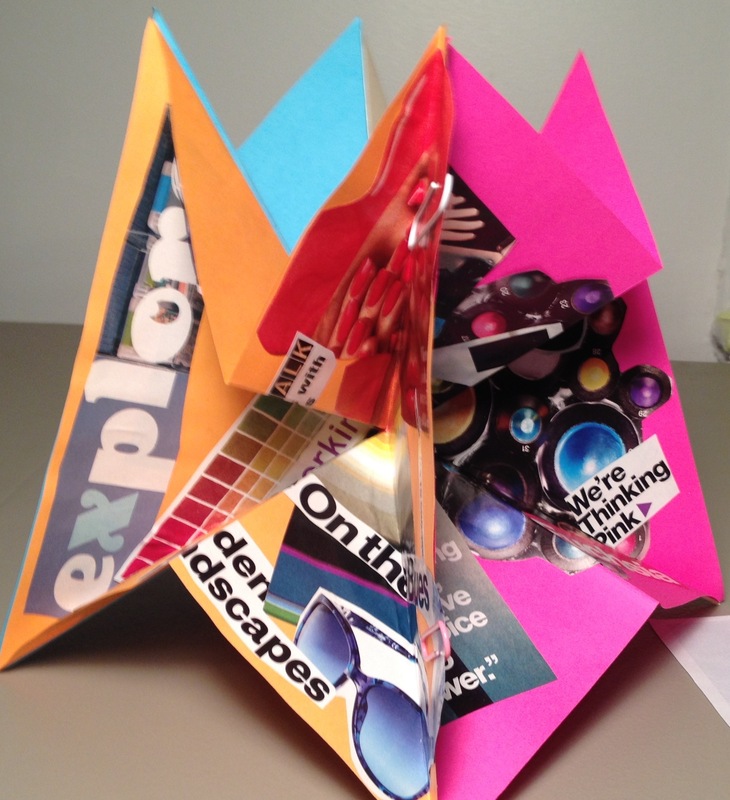 Being a lover of unusual books, I made a version with origami folds, dividing my business vision into four sections. In my most recent one, my vision had grown huge and so did my Right Brain Business Plan. Making it so large, let me embrace and contain the breadth of my vision, encompassing its many facets. What’s your big vision for your business? 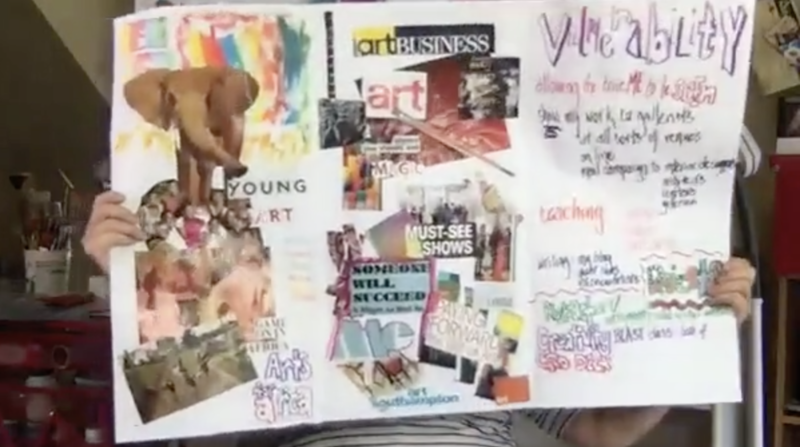 My big vision for my business is expanding my visibility both as an artist and a teacher/coach. I am committing to developing a new series and getting gallery representation for it. I will develop four new online courses and create a new card deck for artists. While I’m unsure of the exact form it will take, I am looking to create an artistic collaboration. To the makers, writers and artists, I suggest you think of all the facets of your work as a business rather than just trying to sell a particular item. By taking a holistic approach, you incorporate all aspects of your business instead of parceling out individual tasks. This will let you plan your business overall. Use your big vision as a holder for your dreams, in all their variations and discover what really matters to you. Get to know your perfect customers and they will tell you what they want. Hold the process lightly and remember to enjoy the ride! Plus, don’t forget to check out Karen’s free gift 15 Great Apps For Artistic Solopreneurs. Want to create your own Right-Brain Business Plan®? 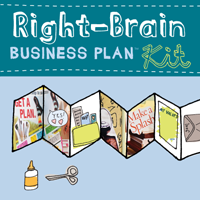 The Right-Brain Business Plan® Kit includes supplies to make your own accordion book style visual business plan.